Dark galaxies are small, gas-rich galaxies in the early Universe that are very inefficient at forming stars, predicted by theories of galaxy formation, and are thought to be the building blocks of today's bright, star-filled galaxies. Astronomers think that they may have fed large galaxies with much of the gas that later formed into the stars that exist today. Because they are essentially devoid of stars, these dark galaxies don't emit much light, making them very hard to detect. For years astronomers have been trying to develop new techniques that could confirm the existence of these galaxies. Small absorption dips in the spectra of background sources of light have hinted at their existence. However, this new study marks the first time that such objects have been seen directly. "Our approach to the problem of detecting a dark galaxy was simply to shine a bright light on it." explains Simon Lilly (ETH Zurich, Switzerland), co-author of the paper. "We searched for the fluorescent glow of the gas in dark galaxies when they are illuminated by the ultraviolet light from a nearby and very bright quasar. The light from the quasar makes the dark galaxies light up in a process similar to how white clothes are illuminated by ultraviolet lamps in a night club." Quasars are very bright, distant galaxies that are believed to be powered by supermassive black holes at their centres. Their brightness makes them powerful beacons that can help to illuminate the surrounding area, probing the era when the first stars and galaxies were forming out of primordial gas. 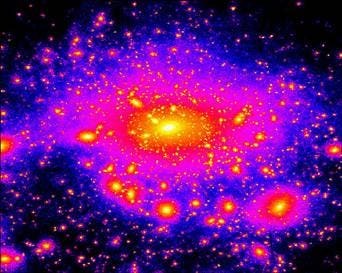 * "After several years of attempts to detect fluorescent emission from dark galaxies, our results demonstrate the potential of our method to discover and study these fascinating and previously invisible objects," says Sebastiano Cantalupo (University of California, Santa Cruz), lead author of the study. "Our observations with the VLT have provided evidence for the existence of compact and isolated dark clouds. With this study, we've made a crucial step towards revealing and understanding the obscure early stages of galaxy formation and how galaxies acquired their gas", concludes Sebastiano Cantalupo. The deep image at the top of the page shows the region of the sky around the quasar HE0109-3518. The quasar is near the centre of the image. The energetic radiation of the quasar makes dark galaxies glow, helping astronomers to understand the obscure early stages of galaxy formation. Dark galaxies are essentially devoid of stars, therefore they don’t emit any light that telescopes can catch. This makes them virtually impossible to observe unless they are illuminated by an external light source like a background quasar. 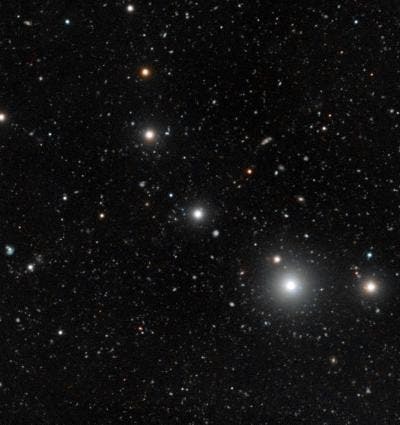 This image combines observations from the Very Large Telescope, tuned to detect the fluorescent emissions produced by the quasar illuminating the dark galaxies, with colour data from the Digitized Sky Survey 2.